Iogo Moment coupon can be found on Websaver.ca’s website. This is both a mail and print coupon. You need to create an account, select at least 3 coupons to mail or print and then claim your coupons. Mailing will take about 2-3 weeks and print you will need to download a software to help print your coupons. I always choose the mail because I don’t always succeed in printing and then I lose the coupon. Mailing is always the safest way and it’s free. 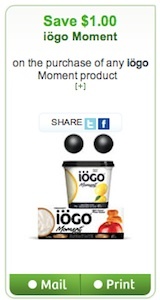 Iogo Moment coupon is to Save $1 on purchase of any Iogo Moment product. Iogo coupon can be used in any supermarket or grocery store. This coupon is valid only in Canada. 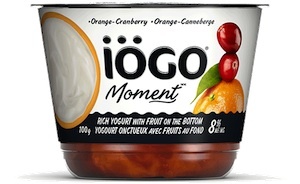 IÖGO is the new brand of great tasting yogurt and dairy products designed by Canadians for Canadians. We have put a lot of heart into creating our products because we believe that yogurt is a beautiful food and the more people who can enjoy its goodness, the better.